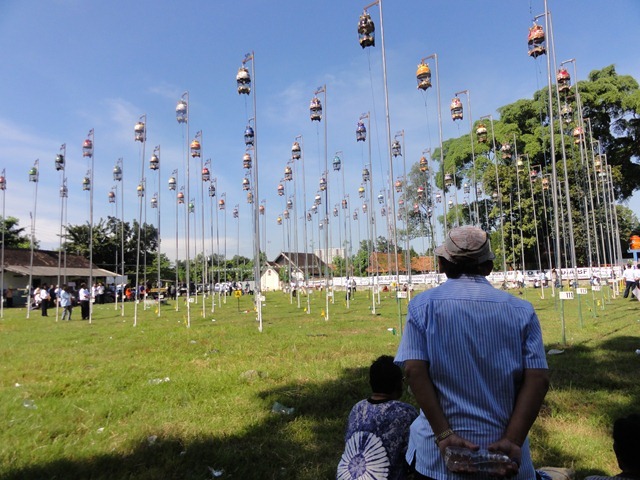 Watching competitions is a great way to meet Indonesian perkututmen. The opening ceremony is formal and bureaucratic but if you stick along, you’re in for a treat. You meet all kind of characters hanging out all morning, albeit under tropical sun. The presence of a white man, Jim, attracted so much interests that all we needed to do was waiting. We met Yoseph who apparently was assigned to assist us with hotel and transportation. But Yoseph took things too seriously, interrupting our interviews whenever he spotted another perkutut high official. Sometimes, I signaled him to wait but to no avail. “Come here, you should interview Mr. Yan Sutta, the head of Central Java chapter of the perkutut organization,” Yoseph told me in the middle of another interview. Then there is Rofid, perkutut journalist from an avian tabloid who tried very hard to impress Jim with his perkutut knowledge. Rofid kept a very busy schedule following every big perkutut competition all through Java. Rofid had a rival Chris, who reported perkutut news on his website. The perkutut organization made sure that both men had accommodations wherever they travelled to. Cagemakers, dealers, and feed suppliers also travelled along. In Surakarta, we saw a perkutut store in a van, selling all kinds of perkutut needs and paraphernalia. I bought hats, perkutut nest from bamboo and pine needles, squid bones for calcium and CDs of former perkutut champions. A Chinese boy, Arief, approached and spoke to Jim in English. He came with his father from the city of Kudus, famous for its huge kretek (clove) cigarette factories, to compete in the juvenile perkutut section. Jim was happy, I could tell, speaking on his own without my translation. Henry saw one Eurasian and immediately thought that we’d be interested. He said, “This is quite rare. Usually only Chinese and Javanese are into this.” But the Eurasian was indifferent and didn’t seem to return any eye contact. Yuma was caught in bad traffic jam and took 18 hours to drive from Jakarta to Surakarta. His bird, Bimo Sakti (Milky Way) didn’t get the one-day rest but still took the fourth place. 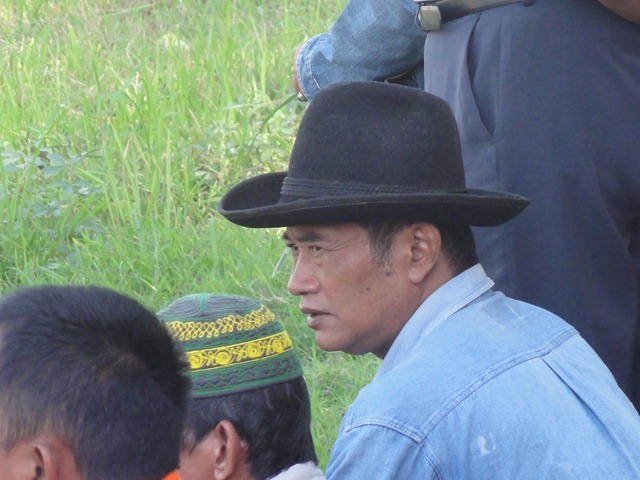 Haji Imam, one of the best cagemakers, came from Surabaya with a novice bird Putra Indonesia who created the biggest upset -shooting to the first place in the last round. Henry quietly offered U$5,500 but Haji Imam decided to sell to Haji Muhammad, the scrap metal businessman from Surabaya for $6,000. Haji Muhammad was a legend himself. In past years his bird Susi Susanti won the grand championship three years in a row. People still talked about him. At about eleven in the morning, lunch boxes were handed out to all competitors. Henry went to the organizers and came back with two more lunch boxes for us. We took a break, savoring the fried chicken and rice in the shade. Very interesting again Kian. Thank you so much, I love to hear about Indonesian culture. You have always made it so interesting. add a sound file to your posts? It would be cool to hear the songs of the birds. terimakasih banyak sudah datang keindonesia dan meliput/melihat perkembangan hobi perkutut di negara kami…meski tidak mungkin booming di negara luar selain asia (malay,thai,sing, indo) tapi minimal sudah bisa memperkenalkan perkutut ke luarnegeri khususnya negara anda….andaikata kedepan masih butuh info seputar perkutut silahkan open http://www.perkututinfo.com atau email saya di teratai_bf@yahoo.com pon 8281904312129.